We have all been there. The case was not properly lubed and, on the upstroke of the press, the resistance and the squeak of the brass tell us trouble has arrived. Here is a quick and clean way to remove that stuck case. Get the makings before you need them, unless you have access to an all night hardware store. 1. 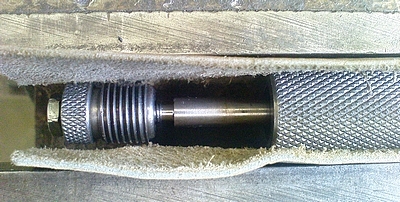 A tap (8mm Metric, 3/8 UNF or similar). 2. 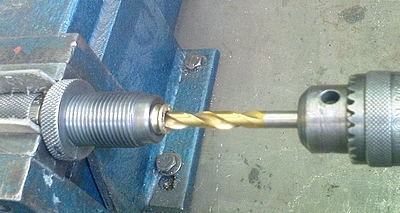 A drill in the appropriate size for the tap. 3. 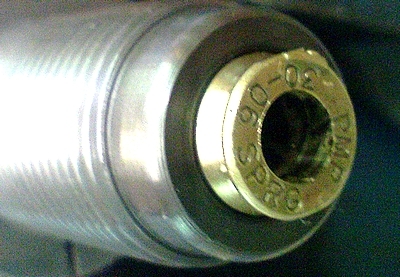 A short section of pipe of which the internal diameter will fit over the base of the case but will not be larger than the diameter of the die. 4. 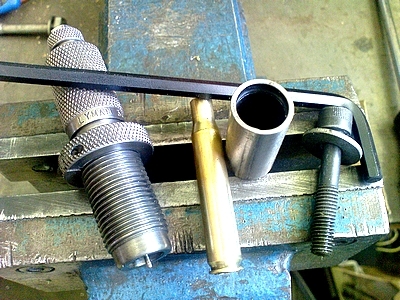 Some washers, one of which is larger than the diameter of the pipe. 5. 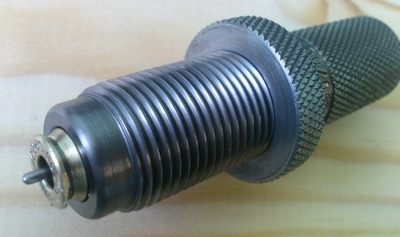 A bolt that is 15mm (1/2 inch) longer than the length of the pipe and the thickness of the washers combined. 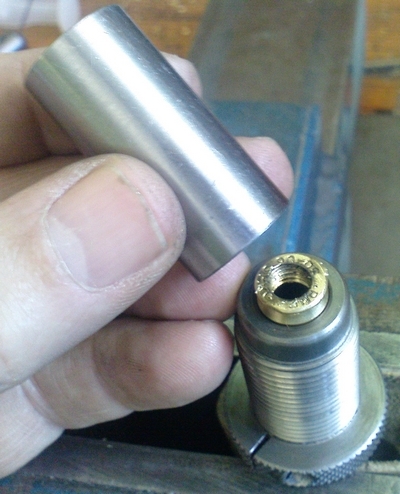 Unscrew the decapping assembly from the die and pull it back as far as possible. 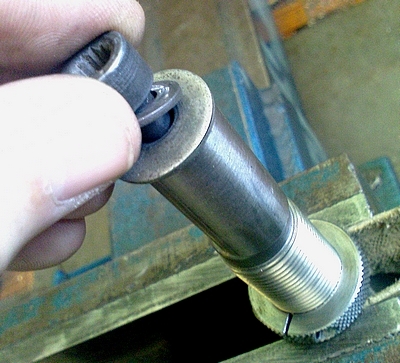 Clamp the die horizontally in a bench vice. 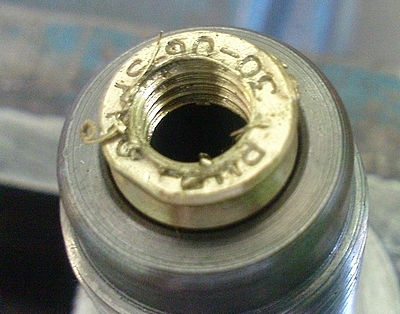 Ensure that the decapping assembly is as far out of the die as possible. Drill a hole through the primer pocket and the web of the case. 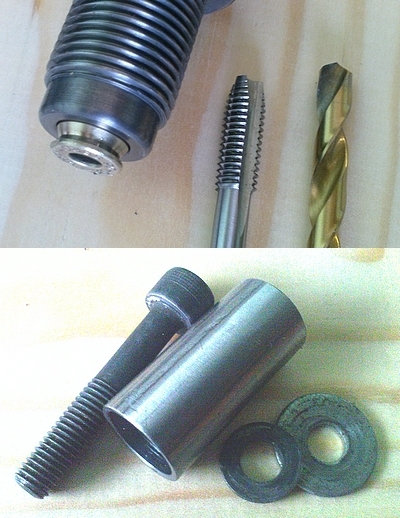 Take care not to touch the decapping pin with the drill bit. Check that the hole is completely through the web of the case. 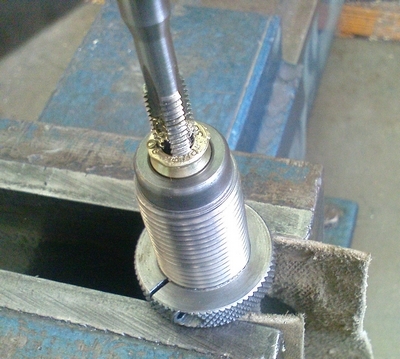 Re-clamp the die vertically, making sure the decapping assembly is down as far as possible. Ensure that the thread is all the way through the web of the case. Place the pipe over the protruding case. 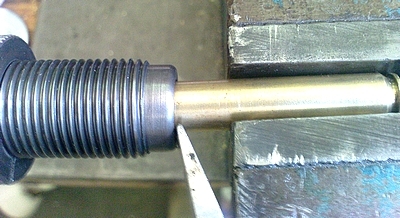 Top the pipe with appropriate washers and screw the bolt into the threaded case head. Crank it up as tight as is required to pull the case. At worst you could strip the threads, in which case you re-tap to the next bigger size and start again. So far I have pulled everything with an 8mm Metric bolt. The case comes loose from the die, but will not come out entirely, as the sizer button is still inside the case. 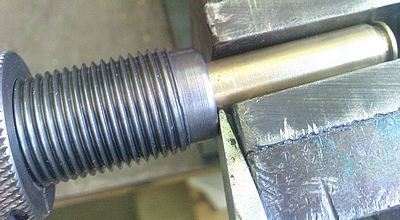 Screw the decapping pin assembly a couple of threads into the die. 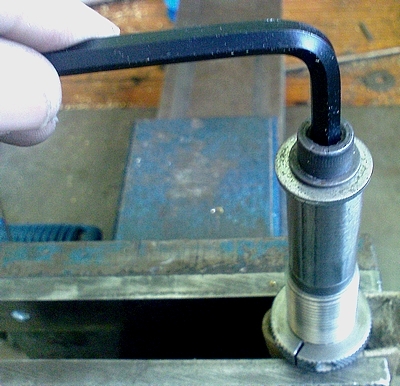 Clamp the case in the bench vice. Leave just enough room for a broad screwdriver blade to fit between the bottom of the die and the bench vice. The case levers off the sizer button easily. All done. 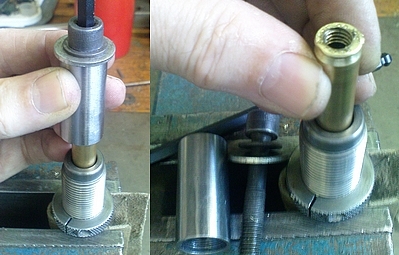 Clean the die of metal shavings internally and save the pipe, bolt and washers in a box. You will need them again some time, even if it is to help a friend.